If you’ve been wondering why there haven’t been any Connected States posts lately, it’s because I had to abandon my van in Portland, OR, fly to three of the four far corners of the U.S. (or near there), and then take a boat to Cuba. The internet situation in Cuba is, como se dicé , “not good.” I have been able to squeeze off the odd Instagram shot, though, and since I’m struggling to upload pictures, I’m mostly just going to use those here. Think of this as a teaser, and know that the full story is coming soon, pending my survival of The Crossing, which is a phrase the group has been using in hushed, reverent tones. Here’s the short version. Cotopaxi, the outdoor gear brand, asked me if I’d like to cover this expedition, which they’d been planning for upwards of eight months. It’s the launch of their charitable initiative called Challenge 113. Basically, you can join their team on Charity Miles, and Charity Miles’ partners will donate $0.25 for every mile of something you do between now and November 3rd up to 113 miles. That could be 113 miles of running, biking, rowing, unicycling while basket-weaving, skip-yodeling, whatever. For us, it’s kayaking. A ton of journalists applied for one of the few slots, but I was lucky. Not long after I was recommended, I happened to be driving my van through Salt Lake City, UT, where Cotopaxi is headquartered, and so I was able to grab lunch with their founder and CEO Davis Smith. It gave us a chance to feel each other out and see if we could handle being around each other in stressful situations for a couple weeks. Luckily we got along well, and once we’d finished our burritos Davis officially offered me the slot and I accepted. My main motivation was to see Cuba before the cruise ships arrive. With John Kerry’s arrival last month and the raising of Old Glory in front of the U.S. Embassy for the first time in roughly 50 years, the doors will soon be open for direct flights from the U.S., bringing American tourists by the boatload. While this will certainly be a major economic boost to the Cuban economy, things are going to change in a big way. I’d all but given up on seeing it before this shift, so when this opportunity arose I jumped on it, no matter how ill-prepared I might be for the 30-40+ hour, 113 mile journey from one marina to the other. But, honestly, how ill-prepared am I really? My busted rib has healed nicely, and while I’m out of shape by my own standards I’m not exactly Mr. Creosote from Monty Python’s Meaning of Life. 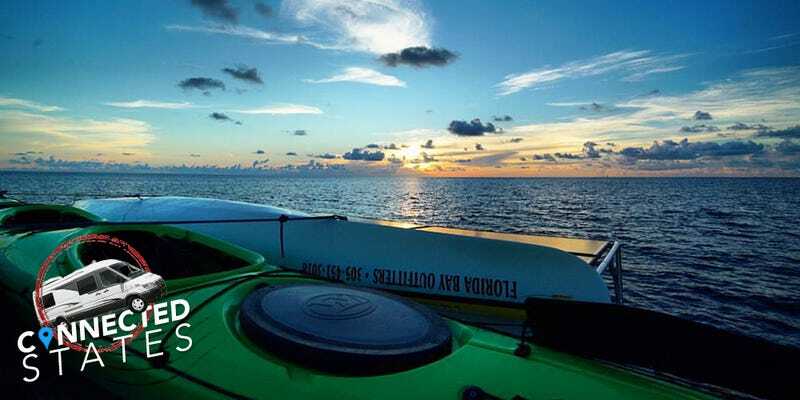 More so, I’ll be in a modern, tandem kayak with a lightweight carbon fiber Adventure Travel Paddles paddle in my hands. We’ll have not one but two support boats with us, throwing us water, caffeine, and food as we go. If things get bad or my body gives out, I can just get out. These are all luxuries that the thousands of immigrants who have made their way in makeshift rafts with cobbled-together paddles, searching for a better life, haven’t had. And so that’s what I’m going to keep in mind when my back is cramping, my shoulders are burning, and I’m hallucinating mermaids on my bow. That said, I’ve promised I won’t have an ego about this. This expedition is a team effort, and the team’s goal is more important than my own. We have four kayaks (including mine) who plan on attempting the full crossing, but our support boats have several alternate paddlers onboard. If anyone starts falling behind the pace we need to maintain in order to complete the mission in a reasonable amount of time, we’ll sub out. And time is perhaps the most important factor of all. Not because we’re racing or trying to break a record, but simply because the longer we’re in those boats the more we’ll be falling apart. Paddling through the night, in darkness, without sleep, is going to be rough. If we go beyond 32 hours—which I think is likely—we’ll be getting into the second night, which I imagine will be exponentially harder than the first. Perhaps my lifelong insomnia will finally be an advantage? Let’s hope so. With me in my boat will be fellow photog and journalist Frank Sedlar. Frank and I didn’t know each other before this trip, but we’re either about to become lifelong friends or mortal enemies. They call these tandem kayaks “divorce boats” for a reason. Frank is 6’6”, 25 years old, and a former rower for the University of Michigan, so when we got to the awkward, middle-school-kickball-esque picking of teams, I made a beeline for him. If I die, blame Frank. The team has a couple secret weapons, too. One is former Olympic gold medalist Joe Jacobi, who will be paddling one of the boats hoping to go the distance. Heading up our support crew is our ace in the hole, Carter Johnson. Carter is the current world record holder for longest distance kayaked over flat water in a 24 hour period. We’re talking 156 miles. He’s going to be coaching through this ordeal, helping us keep a sustainable pace, and advising us on everything from nutrition to lube. Especially lube. We’ve been working with Bill Cottrill of the National Weather Service because, well, it’s hurricane season. He says our best window looks like it starts today at noon EST. So that’s the plan. Cuba, for its part has really gotten behind this trip. There was a big press conference yesterday, a signing of an official “Friendship and Cooperation Agreement” (not that I have any idea what that means), and when we hit the water we’ll be escorted out of the Marina Hemingway by the Cuban National Kayak Team, which is pretty awesome. It may be a circus, but it’s going to be a happy circus. You’ll be able to track our progress live via Spot as we go. Please send vibes for good weather, strong backs, and stronger hearts and brains. I’ve spent the last few days laying low and steadily preparing my mind for the task at hand. Physically, there’s nothing more I can do at this point. It’s the mental game I’ve got to get right. No matter what I do I will be uncomfortable. I will chafe, and ache, and burn. I just need to find my zen within that and keep on pushing. Make friends with pain, cozy up with discomfort, ask despair to prom and try to make out with her during the last dance. Something like that. Regardless of how many miles I end up doing I am grateful to Davis Smith and Cotopaxi for this opportunity to face down some demons and prove a thing or two to myself. For days now all I’ve been able to think about is The Crossing, and now it’s the moment of truth. I’ll have a thorough update on this and more as long as I don’t end up in a watery grave. The quickest way to find out how this ends up will be following me on Instagram, checking Cotopaxi’s blog, and tracking our live progress via Spot. As always, thank you for reading these dispatches. Hopefully I’ll have much more for you soon. Wish us luck. After more than 34 continuous hours in our kayak, Frank and I made it to Key West just after 10pm last night. We are being told that we’re the first to have ever done it in a kayak. We had no idea. Again, we know that hundreds of Cuban refugees have made this crossing before us, but still we are thrilled, honored, and dead tired. For what it’s worth, this was done in a rented, blue, plastic kayak that we had christened Fidel Fastro (and ourselves “Team Underdog.” We’d only spent an hour in it before this attempt. Unfortunately we had some rough seas that first night and it took out all of the other kayaks. Luckily no one was injured. If it weren’t for that and some broken equipment I’m sure we wouldn’t have been the only ones to make it all the way. They other guys were going strong when all hell broke loose. Anyway, Frank and I put our heads down and managed to wave-dodge until the sun came came up. Everybody got back in in the morning and finished out the paddle with us. Still a ton of miles. My hands are bloodied and blistered and I can just barely lift my arms. Everything seems very surreal right now, and the whole crossing seems like some insane dream I had. I’m happy to be alive, grateful for this opportunity, and humbled by the ocean and mother nature, now more than ever. I’m also very grateful to Frank who is an absolute animal. Buds for life. We both had a lot of drank moments, but I’m very proud of ourselfs for making it. I’ll have the full story up sometime soon, but for now I sleep. I sleep and sleep and sleep. As always, thank you for your support.